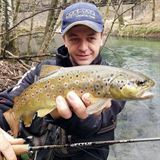 Trout Union Cup 2018 - again in Bulgaria!. Fishing tackle retail and wholesale in Europe (EU) - Angler's Zone. Trout Union Cup 2018 - again in Bulgaria! Dear friends, teams and competitors, we are happy to invite you at the Trout Union Cup 2018. Again, as first time in far 2013, Trout Union returns in Bulgaria! This time TUC will be held on the Vacha river in Devin city from 21th to 23th of September, 2018. Registration for nations is started! The tournament will be held under the current rules of FIPS-ed for Carnivorous Artificial Baits Shore Angling with a few minor changes. Each nation can register 2 teams (8 competitors) + max. 2 captains. The international teams will not be counted for team ranking. And as always, only trout catches will be counted.